New Albums, New Magazine Cover…. New Magazine Cover?? So, as promised, my long-awaited new solo albums are released now! There are two of them because I recorded WAY too much material for one, but after Sue Edwards (my trusty co-producer) compiled the first one, there was still at least one coherent album there. But they didn’t feel like a double. Two distinct experiences, telling different stories. So here they are. I was going to be releasing them next week, but actually brought it forward a couple of days because Bass Guitar Magazine have just announced that I’m on the cover of their October issue, out next week!! This is by far the highest profile bit of media I’ve ever had – it’s a really bold move for the magazine, in a world where the musician press are often pulled towards putting the members of famous pop bands on the cover in the hope of getting noticed in WH Smiths. 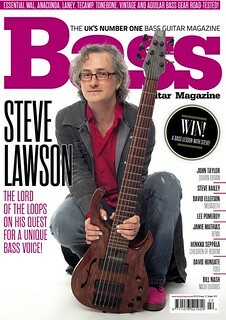 To put someone on the cover who’s highest profile gig is playing completely solo is pretty bold. It’s also a fantastic validation of what I’ve been up to for the last 15 years. I’ve spent less time over the last few years courting the world of musicians, and more connecting with the people who want to listen to what I do, whatever their relationship with musical things is outside of that. So to be featured in the biggest bass publication in the UK would be great anyway. To be on the cover is amazing. Huge thanks to Joel and the team for choosing to do this. So, feel free to reserve the mag at your local newsagent. We’ll have some competition fun with it once it hits the shops.